Welcome 20 delicious, healthy and unique soup recipes! 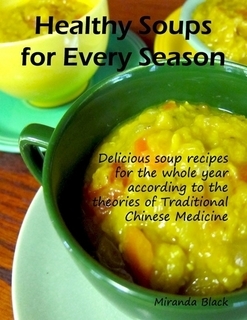 This cookbook was created to suit the five seasons of the year according to the theories of Traditional Chinese Medicine. All of the soup recipes in this book are to be made entirely from scratch, and many are catered to specific nutritional needs like gluten-free, dairy-free, vegetarian, or calorie-conscious. Yet many of the recipes are very hearty and filling, recognizing that good nutrition comes from including whole foods, not from limiting flavor. This product is an e-book, immediately downloadable upon purchase. You do not have to have an e-reader to enjoy this book; anyone with a computer or tablet can use it. It is readable through an Adobe program called Digital Editions, which is available free here.